Why are some Obama '08 'blue' states turning 'red' again? Everything blue is red again... well, sort of. Politico reports that the electoral map - which Pres. Obama remade back in 2008 - is returning to its old patterns. During the presidential campaign, there was lots of talk about how Barack Obama had changed the playing field and put several so-called red states into play. By winning in places like Indiana, North Carolina, Virginia and the Mountain West, Obama didn't need to rely on states that had decided previous elections, like Florida and Ohio. Fast forward a year and a half... Democrats are facing some tough races for Congress and governorships in November in these very same states. No doubt Republicans are loving it, with one congressman saying: "One election doesn't make realignment." 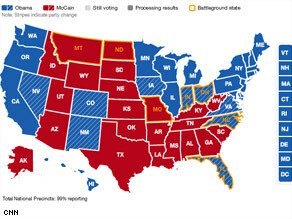 But Democrats insist these states that used to be red will be competitive now, although some worry that without Pres. Obama on the ballot, young voters and African-Americans are more likely to sit this one out. Meanwhile a new poll suggests trouble for any incumbent - red or blue - come the midterm election. And that's exactly as it should be. Vote them all out and start over. The CNN/Opinion Research Corporation Poll shows only 34 percent of voters think most members of Congress should be re-elected; that's the lowest number ever in this poll. 63 percent say send the incumbents home. As for Pres. Obama, a majority - 52 percent - say he does not deserve a second term in office. The American people are angry. Here’s my question to you: Why are some of Pres. Obama's 2008 "blue" states turning "red" again? We were promised change, we got more of the same. We were promised transparency, we got more closed doors. When America voted for change, we were hopeful, but time has past and nothing has changed. I guess if we really want change, we the people, will have to do it ourselves. Starting at the local levels and working our way up. The Obama administration is desperately throwing "stimulus" money at states like Ohio whose governors are weak and up for re-election, but it isn't working! Ambiguous numbers are being touted as jobs "saved/created" and they keep trying to repackage that mess of a health care bill. Independent voters woke up and are no longer buying the hippie hope and change bull they were sold. Jack, Who says they turned red? We haven't had an election yet so why not wait until that time to declare a change in sentiments. My state is turning red because we are bleeding to death. The "hope" is gone and the only "change" I have seen is what little bit I get back from a buck and that won't buy much. Because, Jack, the American people are stupid. Great idea, gang, let's put back in charge the people that ran us into a ditch. Good grief. Jack, Lots of Americans feel that they were lied to. I've heard people say that there were so many problems when Obama took office that he couldn't have been expected to fix things overnight. Well, one year later is not exactly overnight and people don't see that things are any better. One of Obama's biggest mistakes was that he made big promises. When you promise big, you better deliver big and he hasn't. With the overwhelming majorities he had in Congress, he has no excuse and the American people know that. Folks are fickle, Jack. No miracles, no votes. Americans have become a society of children who want and expect instant gratification. Nobody today knows how to wait, that things take time. The President in one year has turned the economy around and it will take alittle time before business people regain confidence enough to start hiring again. Also people have biult in forgeters, besides the fact that the party of NO! has helped in the negative oppinion of the President and his policies. They a just holding their breath until the next shoe drops. That is simple. Obama's approval ratings are dropping like a rock. He has done nothing in heis first year of his term. There was predictions that unemployment will remain over 10% for the next 2 years. Now tthat is change we can believe in right Jack. Because you just said it Jack people are angry and can't wait for change to happen, its not in there financial means to wait! We need change and we need it right now, immediatly. We someone who can balance the budget, create jobs, fix this crumbling economy and fight two wars and we need people with experience otherwise come 2012 America will be looking worse than in 2010! going RED, but the fat lady doesn't sing until November. First of all I voted for our President & still think he was our best choice! I do not beleive that he even realized how hard it would be to deal with all the other "children" to try and get us out of our problems. Vote em all out and start over again to show all the WE THE PEOPLE still have some power! "Saved or created" 2 million jobs!? Bush saved and created 200 million jobs!! When you are viewed as ineffective and do not keep your promises as viewed by the electorate, you are going to alienate people. Not that the Democratic party has done the President any favors. The administration did not reach out to Republicans until it became painfully obvious that they needed to. The administration renegged on making the final health care debate public. The President and his administration needs to truly be a change agent and that means that a lot of those people in his own party are going to dispise him as well as Republicans. However, if the President and his administration would step up and be that change agent, I really do believe that the public would get behind him and things in Washington will change because the public is behind the change. They're turning red again because the Republicans have made it their mission to destroy this President's presidency with their obstructionist NO NO NO on everything. No ideas, No brains! Sadly – Republicans are Nasty and don't give a rats rump for the American People – only their re-election and destructive mission. Unfortunately the Democrats are too nice and try to be non-partisan but they come across as wimpy..... It's time for the Democrats to stand up and let the Rep ublicans have it with both barrels...just like they've gotten from them. 2. The Nebraska and/or Louisiana deal for Heath care votes. 3. Not putting the Heathcare debate on CSPAN as he promised. Simple Jack, voters want to see results. The Dems have great ideas but lack the spine and cohesion to get anything done. The Pres is still looking for bipartisanship. Not gonna happen!!! We want results. Nobody cares or remembers who votes for what when things get done. We all remember who is in charge when NOTHING gets done. Too bad most Americans have already forgotten the Republicans disastrous rule. Because the Democrats have largely been ineffective. They wasted a whole year. You can't blame Obama. There are l;imits to what he can do with the do nothing Congress. He has to be as hard on them as he is on the Republicans, whose collective behaviour has been abominable. The preception is that the inaction is calculated to get rid of Obama. Where are the true statesmen? Have we lost them all?My mantra: Don't send 'em back. Re-elect no one. Insist on Term limits. Deport all lobbyists. If they are citizens, ship 'em all to Alaska. In a word, BLUE-DOGS, – They would not go along with the majority of the party's wishes thinking they were individually more important than the party they represented. I quess they just want to keep them there guns...Hey!!Jack. I'm angry and it's not at Obama. You got an CNN poll for that one. I went from Red to blue got a poll on that one? Because the Democratic majority has not been able to, in one year, make everything hunky-dory, peachy-keen, and super-duper. And the notoriously short memories of voters has already forgotten the eight year long downward slide that put this country in its current state. Now the voters are going to punish them for this fact by putting the Republicans back in power??? Jack, don't count them "red" just yet. November is a ways off. Once upon a time, people were absolutely sure that a Black man would never be president! Americans are unpredictable. Obama has not lost the support of those who voted for him, even though some pundits like to "think" he has! Obama has lost the "blue" states because the people who live there are blue in the face from saying "NO" to his liberal agenda. Because they have bought the Republican Scare Campaign hook, line, and sinker. After a full year of making the American People afraid of their own shadows, and telling lie after lie, half truth after half truth, you know like the Death Panels the thing the Republicans Senators put in the Health-Care Bill and then lied and said that the Democrats were trying to kill grandma off. This is the reason why people are so mad at Congress right now, because the Democrats are so weak kneed to fall into that trap and the Republicans only care about getting the House, the Senate, and the White House back at any cost! I call it the incumbent, looser syndrome. As long as the economy remains tethering no incumbent is safe from loosing his or her seat. The democrats are seen as "incumbents in power nationally" and that is why some of them are loosing their seats. We are in for a long, recycling cycle for politicians. If republicans take over again and the situation still persists, the will automatically loose again. Jack, the answer to this question is fairly simple. Most folks judge the health of the economy by its unemployment rate, the higher the rate, the worse the economy. The current unemployment rate is 9.7% but it lags the economy and will not even approach being normal until late this year or early next year, even though most other economic indicators signal that the recession is already over. To make matters worse, the Republicans, AKA the "party of no," have worsened the stiuation by doing a masterful job of convincing the voters that Obama is to blame, that the stimulus package has not produced any jobs and has failed, etc., etc. This is wrong. The stimulus package has created jobs. Without the package, the rate would likely be in the high teens. In short, the Republicans" have convinced many folks that the economy is going to hell in a hand basket. The Republicans have "won" and the fall elections will hurt the Democrats. But by the time of the next Presidential election, the unemployment rate will have returned to normal, the economy will be on track, and Obama will be elected for a second term. People are gullible and the Republicans are taken advantage of how gullible they are. The Red states may have voted Blue in the Presidential election, but many have remained Red. Mr. Obama ran as a blanks slate. Everyone had hope and hoped he would make the changes that they wanted. The Red staters wanted Red changes. The Blue staters wanted Blue. Now that the President has revealed his policies and agenda, the Red staters are voting against them. Thus Red staters may vote for a Republican senator or congressman not because their residents have changed their mind, but because they never knew what the President's policies would be when they voted for President. They're not. Polls aren't accurate at all these days since it makes for more "drama" for the media if it's a close call. The polls called it a close election in 2008 before the results were tallied and Obama won by a landslide. Same now – just because one Republican took over a former Democrat seat doesn't mean the whole country is turning. Sheesh. The Democrats under Pres. Obama have failed miserably. They do as they please and refuse to listen to the constituents. We voted out Corzine in New Jersey and Lautenberg and Menendez are next. Good riddance to them. The only one doing any good for us in North Jersey is Rep. Garrett (R) in the House. Turning red....maybe its because the present reps & senators haven't done much to help the average citizen but spend most of their time finger pointing, you know–those that don't have face to face access and the ability to make all those contributions that the Supreme Court says are in the realm of the 1st amendment. Jack, Probably because he, Obama, has refused to stick to the promises he made to the people in those states. It's just that simple. No one has time or patience for this nonsense any longer. They many be going back to red now, but the next batch of Republicans won't have much time either. Layne A. Antioch, Il. Reality is setting it, and that is change you can believe in! I am not sure why blue states will turn red. If the American public is so angry then why are they not angry with the GOP. They refuse to work with the President on any issue. Why should the American Public reward the GOP? I just do not see a good canidate within the GOP poll of Presidental Hopefuls. Let's help the president, he has only been in office for 1 year and change. I believe that it is our sitting Congressman and women that need to be replaced. Obama's failure to lead his party and get things done. Any republican that failed to toe the line during Bush/Cheney would have been invited on a hunting trip with the VP. Dems don't fear Obama. Jack, two words – voter anger. American voters are awake and they are sick and tired of career politicians acting as if they understand the 'common' person. If you've never had a nine-to-five job and struggled to pay the bills, then you do NOT understand ninety per cent of Americans. We don't all go to Ivy League schools nor do we all look down our noses at people who take longer than four years to finish a bachelor degree because we had to take time off to work to pay the bills. Because the reds need instant gratification. The Republicans determination to destroy this Presidents and his agenda no matter what is the reason why. The only problem with Obama is that we didn't get to elect a whole new Congress with him. As a fairly young person with a weak Democratic senator (that's you Blanche Lincoln!) I feel compelled to sit November's mid-term out myself. We all wanted bipartisanship, but mostly we wanted something to get done. Now we all we have is the party of selfishness (Republicans) vs. the party of sissies (Democrats) in an all out war of who can be the most petty and least productive. Good riddance to the whole lot of 'em. Lots of Americans feel that they were lied to. I've heard people say that there were so many problems when Obama took office that he couldn't have been expected to fix things overnight. Well, one year later is not exactly overnight and people don't see that things are better than they were a year ago. One of Obama's biggest mistakes, I think was that he made big promises and when you promise big, you better deliver big and he hasn't. With the overwhelming majorities he had in Congress, he has no excuse and the American people know that. This comment is very moderate. Blue states are turning red again because obama has turned his back on main street. We were promised hope and change and instead got more corporate welfare, the number of troops in afghanistan changed, and now you can only hope you get a job. The Obama administration is desperately throwing "stimulus" money at states like Ohio whose governors are weak and up for re-election, but it isn't working! Ambiguous numbers are being touted as jobs "saved/created" and they keep trying to repackage that mess of a healthcare bill. Independent voters woke up and are no longer buying the hippie hope & change bull they were sold. But GOP beware: doing nothing does not = votes! As I see it, this is really a matter of nationwide frustration rather than a strict Blue to Red or Red to Blue thing. Incumbents out is the cry but what does that really mean? It means general satisfaction with the course of the country is in the toilet and most Americans realize that both parties share the blame. It's not accurate to say it's Bush's fault when the Democrats controlled congress for the last 2 years. To most of us that just shows the blame spreads to all... The frustration will ouster incumbents on both sides not so much because the voters think the other party is better, but because we are desperate for a total reformation. They are turning red again because people are disgusted with Washington, but have no viable option to the two parties. The solution is to turn them out after one term and hope that minimises corporate control. They are turning Red because they were always center right states, that did not change with the election. Obama won in those states on anti Bush votes not on votes endorsing a liberal/progressive, big government, tax and spend agenda. Obama broke too many promises and is pushing an agenda that does not appeal to the center right voters in those states. He has lost their trust and I don't think he can get it back, at least not in time for the Nov. elections. Obama is running against Republicans and BLUE Demons. Obama didn't win the red States because of their support but because of the message. Democrats and independents can't blame Replican'ts. They have to blame these so-called Blue dogs (Blue demons) for everything that goes wrong in Washington. Bush took us to Irak with what kind of majory? Obama should remember who sent him to Washington instead of thinking about how to good friend with Lieberman, Landrieu, Bhay and Nelson. Did Bhay said good bye in good way? Very few people actually sit and listen to all of the facts pertaining to the issues. People are just plain stupid; especially in the red states. We have people every day who complain about some important issue, such as health care, and then these very same people vote for the Republican who is looking to shut-down most programs that would have helped them. Becasue the American people are buying the propoganda being put out by the Republican party leadership. I you call a duck an eagle long enough a great number of Americans will believe the duck is an eagle. They forget that if it walks like a duck and talks like a duck chances are it's not an eagle. was started by upper middle class white rural men to avoid paying their fare share of taxes. The "Mass" of Tea Party people are an odd mix of conspiracy theorists. Just as in Hitler's time, the Black President, the immigrants, or anyone else except wealthy Bankers and Mortgage companies become the whipping boy for this group. This is a hostile environement, and the Tea Party appears to be winning. They wanted government to do nothing, and that's what we have. In 2008 you had the economy tanking, the most charismatic candidate running since Reagan, and a sitting president with terrible approval ratings. The Democrats could have run a dead raccoon and gotten 45% of the vote. Those "red" states that went for Obama didn't turn blue. Jack, you answered this question already...the American people are angry!!! The only way we can show that is by voting them in and out, until they figure out that every day they play their sandbox games is another day our country and our citizens suffer due to their childish ways. Jack- they are not" turning back to red", they never changed. What happened in 2008 was people voted for a man or against another. In 2010, when the mid-terms show shifts, it will reflect the dispare so many of us feel for our incumbent politicains. Republicans don't change. Democrats don;t change. And "independents" sre people that think they are neither. The fact is, our two parties represent a wide view on either side. And even an "independent" hleans one way or the other. As an impartial citizen of Canada, I would have to say that 2009 was a wasted year, maybe even worse than wasted. The stimulus package dished out early in the President's first year now appears to have been perhaps worse than useless. It gave the appearance of "change you can believe in" but now a year later seems to have spawned a greater problem, namely the obscene 1.2 trillion dollar fiscal deficit. The rest of the President's first year resulted in nothing but partisan bickering and the nagging feeling that this administration may be even more corrupt with backroom deals and lobbying giveaways than the horrid Bush "era". Voting Democrat or Republican in 2010 seems like choosing between a root canal or an enema. Why? Because at least a third of the voters are schizophrenic when it comes to politics. They change their votes based on emotion rather than reason. They jump on the band wagon of who ever makes the most noise. If anyone is to blame for our dysfunctional government, it's uninformed voters muddying the waters when it comes time to vote. It's no wonder nothing gets done, the voters constantly send mixed signals. It's simple Jack, Americans are the most impatient people on the planet. Need proof: take a look at the percentage of Americans who start a diet and never follow thru. No dismantling of Al Qaida. How we call Republicans experts in National Security I have no idea. Because he does not know how to LEAD. Tell us he wants this done but does not give guidelines to get it done. This is not the change we wanted. Obama is running against Republicans and BLUE Demons. Obama didn't win the red States because of the support of so-called Blue Dods. He won because of his message. We knew about his Healthcare plan because he talked about it during campaign and we can't be surprised now. We want the bill to pass. Democrats and independents can't blame Replican'ts. They have to blame these so-called Blue dogs (Blue demons) for everything that goes wrong in Washington. Bush took us to Irak with what kind of majority? Obama should remember who sent him to Washington instead of thinking about how to be good friend with Lieberman, Landrieu, Bhay and Nelson. Did Bhay said good bye in good way? Oops Jack, are Medicare and Medicaid government run programs or they are run by COMPETITORS...FREE MARKET or No regulated...? We are almost to pre-WW2 Germany. Pretty soon we will have hundreds of parties. Because people are seeing him for what he is-a politician that lied to get elected. The one campaign promise he can still keep is the one to "hold illegal employers accountable" which would open up 7 Million jobs illegals have. When he said illegals go to the E.R. and we pay for them and still does nothing on top of our massive unemployment problem-he and his majority should leave office because that one thing costs NO additional government dollars to implement!! People woke up and smelled the waste and corruption in Obama's administration. Transparency was never going to happen. Back room deals and Chicago gangster politics. The same old blame game going on. A president who can't manage, can't be a leader, but is really good at making speeches! Take your pick! Its simple the democrats are just as mush screw ups as the republicans if not worst . Welcome to "The United States of Ameri-Corp LLC"....Where not only can your dollar buy the latest in sub-standard and toxic Chinese imports but thanks to the folks in our Supreme Court Marketing and Promotion Dept. we are now able to offer a wide variety of elections at unbelievably low prices..........."Save money"....."Live better"!!!!!!!!! That answer your question Jack??? If the United States were a monarchy, Barack and Michelle Obama would now have superior ratings for their social, speaking, and affairs-of-state skills - they are fantastic in that regard. But, since we are actually stuck in a Great Recession with a disfunctional Congress and little real beef in the White House, the colonists are pissed. Jack, if asked why these '08 states are turning red again, I'd have to say that this is happening for two key reasons. One, is that Obama ran a very effective Presidential campaign, touching on all the critical nerves and calling for change. That's why they switched in the first place. Two, is the very liberal agenda he has for the country. Now looking at all aspects of the problems facing this country, I can't say his agenda is completely wrong, but it is quite obvious that these '08 "Obama States" don't like it. People who are fearful lash out at the first thing that they believe is causing the fear and become angry because of feeling helpless by those doing nothing for them. A Democratic led Congress is stalled by putting up with the "Say No, Just Because" crowd . It has been one year and those people who are caught up in fear are doomed to drown because they fight against the very thing that is trying to save them "Change". Obama is a great orator and campaigner, but, his words ring empty for most Americans now...he was going to be a centrist...a uniter... post partisan...post racial....remember? He has shown himself to be a rigid idealogue, which doesnt sit well with the majority of Americans. The direction he has allowed for and taken this country is not what the vast majority of our citizenry want. His presidency is in big trouble because many of the same people who voted him in will be part of the team that votes him, and all who follow him, out! Beggining Nov 2010! There is a good side to this.... Obama has risen the sleeping giant that is America... The extremes on both the right and left are soon to be has beens....The independent majority will rise to the occasion. It's simple Jack, America is full of misinformation and beer. The republican "just vote no" campaign is actually working. All because America is too disinterested in politics to examine what is actually happening in Washington. Simple. Obama encouraged many to come out and vote, and without that kind of excitement this election cycle, many may stay home. Not to mention there are those who believe that government works better when there is some sort of perceived balance of power, democrats in congress, republican in the presidency, or vice versa. Why are they turning red again Jack. Because people have a 10 second memory. The fluctuation of blue to red is indicative of the "what have you done for me lately" mentality of the electorate. The body politic is little more than a child being distracted by the latest shiny object. For once, I'm in agreement with you. Send all the Congressional Bums into retirement. To the question at hand, these states are turning Red to match the Red in many folks 401Ks. The reason is ignorance and impatience Jack. It takes more than a year to fix what 8 years of destruction caused. The american people can't see the most genuine attempt from a politician to be as anti-politician as possible even when it's right in front of their eyes. We believed in Obama's ability to accomplish change, but, as it turns out, he is just another politician. People forget that it was a Republican President who made a mess of this nation's economy and ran up trillions in debt. People don't want to wait for things to get better; we want immediate results which just isnt realist. It's like your credit score; once you mess it up it takes years to rebound. I just wish people would sit down, shut up and give someone a chance to make the necessary hard decisions it will take to make us more competitive in this century. If you keep changing drivers, you're going to get lost. Jack, here is what I say about the Reds and Blues. How about VOID? Vote Out Incumbent Derelicts. Doesn't matter what party. Just get rid of them! Obviously these folks can't wait to get back to the wars, debt, and global insolence of the Bush years. One year of trying to dig ourselves out of the hole we're in was one too many for them. Because Jack, it's not about the party, it's about incumbency. The Republicans won't be any better than the Democrats, they'll be worse, but the only way we can show how we feel is at the ballot box. It's a shame there's only two viable political parties. Almost makes me want a parliamentary system. Almost. Because 60-70% of Americans' IQ are below the mean and can't grasp the obvious: you can't fix 8 years of screwing up in 1. Gee Jack. Would it be that Obama turned out to be just another opportunistic politician? Excuse my sarcasm. It's because the average American has a low IQ and ADD. They expect results immediately and keep incumbents worrying about getting re-elected rather than solving long term problems. The wheel's turning again, Jack. Jack, the American public is so sunk in a mind set of "it isn't fixed NOW, the other color must be better" they are ready to vote in anything that isn't what they have now. In my opinion, while Congress is largely to blame, so are constituents who constantly send mixed messages and who expect everything the personally want to happen immediately and many condemning true bipartisan work. I honestly look at my fellow Americans as the main problem in what is wrong with Washington. Mixed messages, lethargy until they think something affects them, pure ignorance on facts and an inability to educate themselves is as much what is driving this country in to the ground as anything. Easy answer, Jack. Propaganda. I'm not saying Obama hasn't made mistakes, but the very idea of a power struggle between rival parties in government makes us about as functional as a third-world country ravaged by civil war. People are finally realizing that most politicians are crooks. Its not that the people are for the Republicans its more that they are anti incumbent. The good new is Obama can keep his job by making sure Sarah Palin is the Republican nominee. The American people are entirely too ignorant to realize that this whole economic recession was due to the inept policies of the Bush Administration. Republicans are trying to convince the uninformed that the problems with the economy are the result of Obama's policies, when the fact of the matter is that the stimulus and the bank bailouts stopped our economy from falling into a depression. We should be thanking Obama and the Democrats, not chastising them. Former NBA Suns Player, Charles Barkley said it best –"Fans are fickle". If you are winning, they support you, when you are not, they do not support you". If we had known about the real state of affairs prior to President Obama's election, I do not believe Congressional members that won re-election would be there right now and the Presidential Candidates would have to really convince why we should vote for either of one of them to improve the economy and ensure that citizens would not lose their jobs. However, I am convinced that getting rid of the incumbents in both parties is a good idea. Out with the ones that created this mess (Bush did not do this alone) and in with fresh new ideas. Is that really possible? States aren't really turning "Red" or "Blue". Voters are simply rejecting incumbents of both parties. President Obama is also being graded on the substance of his policies rather than his seeming youth and newness to National politics. A majority of us now believe that the extreme left policies of the Democrat party are actively harmful to our own personal economic welfare and to the future of our country. The reason these states are turning red again, is the conservative media. Most normal Americans rely on television and internet shows to form their opinions about society, politics, and religion. The problem with this is when the "facts" aren't true, or at best, bias and twisted. I praise CNN for its unbiased portrayal of the news, but FOX and other stations like it, do not hold the same ideals in their news casting. All this comes back to the original question: Blue states going red. Americans are convinced Obama isn't doing a great job, due to what they hear from Beck and Hannity, and that could quite possibly affect the next presidential elections. Should the media have the power to sway a nation enough to change its course? One CNN watcher says no. Keep up the true news casting Wolf! Jack, the American public is so sunk in a mind set of "it isn't fixed NOW, the other color must be better" they are ready to vote in anything that isn't what they have now. In my opinion, while Congress is largely to blame, so are constituents who constantly send mixed messages and who expect everything they personally want to happen, to happen immediately and many condemn true bipartisan work due to this fickle selfishness. I honestly look at my fellow Americans as the main problem in what is wrong with Washington. Mixed messages, lethargy until they think something affects them, pure ignorance on facts and an inability to educate themselves is as much what is driving this country in to the ground as anything. They're turning red again because the GOP is winning its campaign of lying big enough and repeating it often enough that it is becoming "true" in the minds of many. Its easy. Obama's name isn't on the ticket. Im a young person and I never vote in local elections because they're not interesting to me. It's who's going to be my President that usually gets me out of the house and into the voting booth. Come 2012, I'm voting Obama again. Jack, it it easy to see that Americans are dissatisfied with the leadership in Washington especially the partisan inability to pass legistation. There are unprecendented challenges facing our nation, yet there is no compromise. This is not a message to Democrats or Obama, but to all of Congress that their current political games are unacceptable. Simple, the American people are too impatient to allow Pres. Obama the needed time to clean up Bush's fatal mess. Fact is Change doesn't come quick, or clean, or uncontroversial. Why not allow the president to time needed to clean up? Simple, the scare tactics used by the bush crime family is still being implemented on us today. Wake up America and settle down. WE elected him so lets allow him the chance to do the job. These states are "turning red" because the American people are like impatient children. We keep saying it takes time for things to turn around... and that's true. Although I can imagine it's much harder to hear when you're in a tough spot. Would I like for the President to toughen up? Yes, I think we'd all like to see President Obama "straighten up and fly right" but it's so hard to do when you have everybody fighting you at every turn, even people in your own corner. Why? Lies. Lies about the President's agenda and intentions, let alone his very citizenship. Lies about Democratic policies. Lies about legislation that the majority of Americans actually want, until the lies convince them they don't. Lies that prey on fear and the worst aspects of the American character. But most of all, lies allowed to succeed by a majority Democratic party seemingly intent on its own destruction. I think the reason is that Obama and the Democrats overly estimate their win in Washington and forgot that in this day and age of the information superhighway,Americansare highly and quickly informed about what's going on domestically and internationally. The information age is in the palm of our hands in our cell phones or laptops. I call it Mobile Information Technology. Blue states are "turning red" for precisely the same reason the Tea Parties exist. FEAR. Polls are now the country's panic room and everybody needs to vent, but once inside the voting booth rationality will take over. Let's hope. People are angry. Question- Who are they mad at? Answer – The one standing before them. They see Obama's face and they blame him for where we are now, forgetting how we got here and which group left us in this shambles before he took office. As a people we still have the "instant gratification" syndrome. We want these problems fixed immediately, but the truth is as Obama said before he took office, we didn't get here overnight and it will take some time to get us out of this mess. I believe Obama is both smart and dedicated to fixing the mess he was given and he deserves our investment of time to give him his shot to see some significant progress. The reds left us in the red, give the blues at least as long to get us moving forward. Because they weren't blue in the first place. We were simply fed up with the Republicans and it took less than a year to remember why our states are red. Because most of the population has been mislead by lies and spins from the conservatives. Example: Republicans call the health care reform a "government takeover of the health care system", when it is only a reform of the insurance portion. How many more examples do you want? Well Jack, it's because some people don't know what's good for them. For some reason, people think that bringing back the clowns that were in control of Wasington for 8 years and that got us in the mess in the first place will somehow make everything better. It's just plain stupid if you ask me. The voters who supported Obama and now are switching allegiance have got it all wrong. The reason the country has made little progress is due to Republican obstructionism. What we need are progressive Congressman who will have the guts to put their jobs on the line to get a decent healthcare bill passed. If the progressives hadn't been so gutless and a had passed a healthcare bill that provided competition to the outrageous increases in private corporate healthcare costs, Obama wouldn't have to worry about losing support. Only the diehard, rightwing ideologues would still be whining. 1. Because Americans want instant gratification and aren't willing to give Obama a chance to turn things around. 2. Because an electorate with a short attention span is easily duped. Republicans have taken advantage of that, lying to them about the past, and skewing public opinion against Obama. 3. Republican obstructionism has made it impossible for a president who ran on a platform of bi-partisanship to accomplish anything in a bi-partisan way. Why blue States turn red? Because people are plain stupid, ignorant. 1. Transparency was a promise – He is seen as "disingenuous at best and a political liar at worst for this broken promise. 2. Back room deals were sleazy. 3. He talks everyday and doesn't appear to be doing the "people's work". He now has a reputation as a talker who is trying to get back the "magic" but it's not working. I don;t understand american people. They forget the 8 years of the previous government , which led us into this situation including a war and only after one year of Obama's assumption to Government they pretend everything to be done?? aren't people going crazy or stupid. Because folks in the south -Virginia, Carolina, Florida -are more backward Jack. They are less educated and are easily duped by a Republican party that's dedicated to the fat cats while pretending to worry about the little guy. This is not gratuitous name calling – the south has higher school drop out rates, lower college enrollment rates, higher teen pregnancy rates, higher obesity, higher tobacco consumption, more divorces, more crime, higher infant mortality... The irony is the south also relies on Washington for more financial support than any other region. It's ignorance, plain and simple. There is a cold war going on between the rich and the poor. Institutions like the Pharmaceutical Companies, Medical Insurance Co.s, Large Corperations, and the like are deliberately down sizing and raising costs and anything else they can think of to make it seem like society as we know it is coming apart at the seams. I have seen my medicine skyrocket in price recently. And Medical Insurance Companies use changes in their formularies as excuses to hassle people and delay them getting their medicines if not out right deny them. I've seen 15 minute waits at the Pharmacy turn into 1 hour plus waiting time. Americans are so busy just trying to survive that they don't often notice when they are being tricked or victimized by misdirection. I saw the same thing happen with Clinton in the nineties that is happening with Obama now. The Oligarcicial (spelling?) principles don't like Obama. Jack, most Blue States are turning Red again because Blue hopes has been dashed by the current adminstration. It is better to be with Devil you then the angle you have not seen. President Obama is failing the Blue States. It's not so much 'blue turning red' as they're turning "Red, White, and Blue". And I don't mean the Tea Party. The ultra partisan 2-party system that has a political monopoly is completely self-serving. This is nothing new, the Democrats would have rather lose a war just to make Bush look bad, the GOP did the same thing they are doing now to Clinton. Both parties are selling out our future just to stay in office. We desparately need a viable 3rd Party that walks down the center and has the United States' best interest at heart, not their political party. Until that moment happens, I'll vote Libertarian. Some blue states are now turning red because they thought President Obama would be a miracle worker and quickly fit the mess created by the Busch Administration but then reality set in. They are naive to the real problem...the republicans in the congress. Very simply- The Stimulus package failed and we are fighting two wars now. Liberal or Conservative you have an issue with the President. Jack, it's because this is a nation of people who demand instant gratification. No excuses, just solve all our problems NOW. I wonder how these former blues would like having a tea bagger for president. If Obama would have been a CEO "USA Incorporated", he would have been fired by now! People are angry, disenchanted, and disappointed. And therefore I am not surprised that those once was red states that turned blue to helped him put to office are now easily turning back to being red. I cannot believe that our country is turning red. The only reason that we can't get anything done is because the GOP wants to keep resisting everything that the Demos want to do to help the people in the furture. They do not care anything about our country. They only care about their future in politics. Obama has tried to get us on the right track, but can't get anywhere because of the GOP's. It is the first time in a long time that we have a president that cares about the people. It just baffles me and my family. I hope that the country will finally realize, at some point, that we are in a crisis, and it can't be done overnight. I have type 1 diabetes, and when our cobra plan is done, I don't know what I am going to do because no one wants to insure me. because republicans are so good at lying and p.r. about everything ,and most people have short attention spans to remember how bad it was with Bush in office. Why blue states going red? That's easy, people have a short memory of what it was like to be lead by Bush. This brings to mind new meaning to the term, "better dead than red". I don't think they are. It's the media slant on it. Yes there is a lot of dissatifaction all over america, I received a call from a local pollester and the way the questions were worded all of my answers made it look like I was anti-Obamba and pro republican. Based on that call I now no for sure that polls mean nothing. Because it's only a game to them, nothing more, nothing less. "Let's turn this red state to blue and let's turn this rblue state to red." Where is the humanity in there? The real people's lives, who they have such grave impact upon. Our 2 party system is a sin and the "party" is what they'been having at our expense. I have yet to hear a politician say he will make things worse if he is elected, they ALL say they will make things better. They are liars, they are just interested in keeping their jobs by turning colors on a wall map. with 700 bilion dollars, i could turn this whole thing around in 3 weeks, I wish i hasd the format to espouse it. What's surprising about this? Anyone with an email address gets daily " FW:'s" as part of a distribution list of thousands, accusing Obama of everything from fascism to socialism to Muslim to Rev. Wright Christian. The Tea Party Nation and Sara Palin have made their move... God help us! The money should have been put in the hands of the people and the businesses should have been made to earn their share. Low interest loans to and for the people... Let business figure out how to get their share inorder to stay in business. Is it not what business is all about... That is call making money for your business. Why are we up side down!!!! Not difficult to answer this one. Two complete idiot dictators in Pelosi and Reid, and way too many czars. If the American voters don't throw our every incumbent they (voters) deserve this abusive and ineffective pitfall of a government. Voters have realized that Obama is a liar and never meant to keep his promises. He ran as a centrist and people have found out that he is as far left as Pelosi and Reid are. Look at the debt, deficit and government takeover of private sector! I can understand anger. However, it's Republican rule that has got us into this mess. Obama and the Dems can't be expected to fix something in a year. Besides they don't have a supermajority. Also Democrats don't act in sync like Republicans. There's never been party discipline with Democrats. If voters want to make a statement, they should vote for ANY third party. However putting the Republicans back in power will effectively end government. I don't understan american people. Are they nuts or stupid. They forget the 8 years of the republican administration that leds us where we are now , and now they pretend to have it back in one year ... it is time that they get to think and be more positive. That's easy, Jack. Republicans control the messaging, including, sadly, the news media. And when you control the messaging you get to scare the living hell out of the ignorant. See last summer's town hall screamers, as an example: "No government run health care, but don't touch my Medicare." Really? Remember words matter and apparently the words from the campaign are no longer relavant was one thing to talk ,which Obama does alot of especially to the lobbyists. Just because he was the great hope doe not mean we shouldn" hold him or other politicians accountable. it was bait and switch and people feel this way. People all over our nation are realizing that they elected a totally inexperienced, totally incompetent President who cannot lead, cannot make decisions and cannot put two sentences together without reading from a teleprompter! (and some people call Sarah Palin an 'idiot'? Hello?!) America has finally awakened from the 'dream' of "hope and change" and realized that it has been a nightmare! Wait and see what happens in November. Say bye bye to Reid, Pelosi, the House, the Senate and in 2012, say bye bye to Obama!! The expectations of many Americans were too high, and they should have realized that anyone wanting to change the way Washington works was in for a tough fight. Especially when it comes to turning the economy around, and reforming Health Care. Reforming anything in Washington is an uphill climb, doesnt matter if its Obama or anyone else who thinks they alone can change the system. Americans have to be more patient– things will turn around, but at a very high price. People are severely misinformed. And, if they are not misinformed they have no information at all. The party that drove the car into the ditch are doing nothing but standing on the sidelines telling us that Obama can't tow it out....and the media buys into their rant. I won't forget who sent our jobs to China, who started to war for oil without funding them, who passed the 'Patriot Act', who wire tapped us without warrents. But, the media has forgotten. And since it is not on TV, it's not real to most Americans. People have relocated to other States for various reasons and this isn't uncommon with a shortfall in the employment market. It's simple........they would rather give the power back to the same politicians and special interests that caused this economical disaster than to continue with the spineless 'can't get anything done even with a super-majority' democratic party. Sad thing is that there's really no one in our government that's looking out for we...the people! Because redistributing our wealth to high school dropouts, illegal aliens, and other professional welfare recipients wasn't the change we voted for. We're an impatient bunch! We don't want change now, we want it ten days ago! True, we do need a congressional enema to get rid of the old school, Democrats and Republicans- they're looking out for the people that line their pockets. I know it's tough out there for eveyone, but don't be impatient! We could potentially vote out of office one of the best American Presidents this world has ever seen! Uh, because people who live in Red states are used to voting against their own best interests. It's a habit, Jack, with some confusion mixed in. They want a lower deficit with tax cuts? They want jobs with tax cuts? They want health care with tax cuts? Yikes! Interesting you chose to air so many answers that say "it's not working" when the majority posted agree that it's the people who are impatient and easily duped by loud sound bytes. Lying Republicans using scare tactics. Tea bags using racial slurs and signs etc. Non partisin help among the party of NO. Not caring about the working people of this country...... and the Conservatives are supposed to be God's followers? Bush and company gave him such a mess to clean up and people forget how hard it is to catch up when the country was deep in debt when Obama took over. What else should you expect when the media spends the better part of a year reporting on unsubstantiated rumors and attacks by Republicans and portraying a group of sore loser conservatives as a nationwide movement of angry, independent voters?